How great would it be to jump on the couch, grab your Wii U GamePad, and fire up an old classic like Super Mario Bros. or Ogre Battle 64 while you watch TV? Well get ready to be disappointed, because that’s not going to happen. This video is in total Japanese (there’s not a translation as of yet), but Polygon has the details of the message. 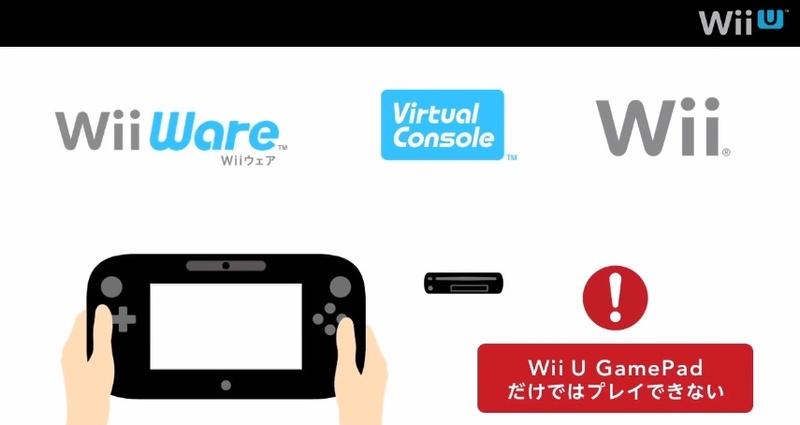 Let’s get the bad news out of the way first: you cannot play your existing Virtual Console, WiiWare, or Wii titles on the GamePad, just on the TV. You can play the entirety of Mass Effect 3 on the GamePad, but Clu Clu Land is a little too much? I know that’s not the case – the hardware is certainly capable. Nintendo just doesn’t want you to do it or was too lazy to make your old VC titles work on the GamePad from the get-go. And that is ridiculous. Nintendo is looking to make a Wii U Virtual Console, and let’s just hope that the games you have already bought on the Wii will be transferrable to this new Virtual Console. Still a shame. The good news – although we already knew this – is that you can plug in an external HDD to save games or DLC to. The HDD can be up to 2TB. If the history of the last week or so holds true, we will probably have a video by Bill Trinen soon explaining these things in English. When that happens, we’ll update this post.